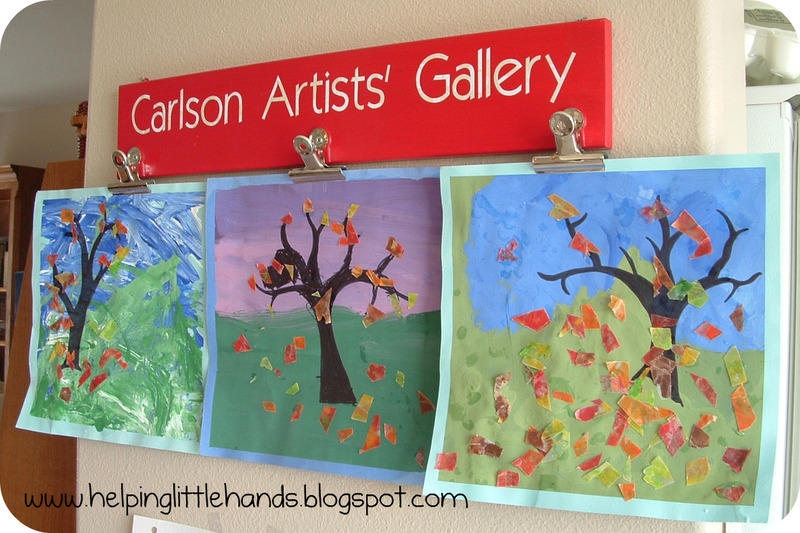 I saw a "Fall Trees" project from Gail at That Artist Woman a couple weeks ago. (I LOVE her site because the projects she does end up looking like art and not just a "craft" project.) I thought they were so pretty and figured I could do all the background and then just have the kids add the leaves. Then I had a bit of an epiphany about really young kids and art projects. You can get a nicer finished project if you only have them do one concrete step at a time. I know...I know...you all knew that already, but it just barely dawned on me. So I thought we'd try out my new strategy with this project. I gave Little Brother a cupcake tin with different ratios of blue to white paint. 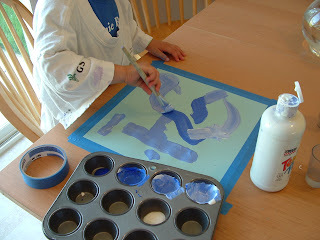 Blue and white were the only colors we used. I told him to cover the whole paper with paint. He did a great job and took his task quite seriously. Sweet Pea was having fun with the paint, but kept wanting more paint in her dish everytime she put the brush in...and she always painted the same spot. 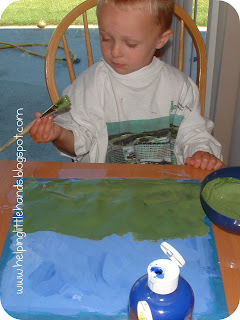 But Sweet Pea was more willing than Little Brother to experiment with things like using a noodle to add texture. What I found worked best for her was to put dots of paint on the paper for her. Then she'd have fun swishing it around and wait for me to drop the next glob. By giving her drops of blue and white in different places, it gave a nice mixture of blues and I was able to get her to paint most of her paper. And we took baths after since there was paint in Sweet Pea's hair. Little Brother is actually a fairly clean painter...which is making these art projects pretty doable. Then we let their papers dry...for several days (All it really takes is a couple hours, but we didn't get back to the project for a while). 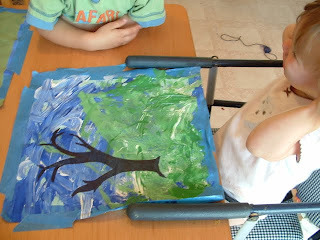 Then, we pulled the paintings out again after reading "The Blue Goose" by Nancy Tafuri. This is a really great book if you're doing a color unit with kids and was especially good for leading into a painting project. 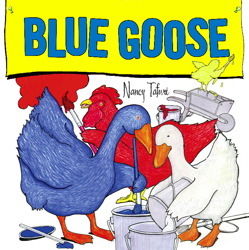 In the book Blue Goose, Red Hen, White Duck, and Yellow Chick get together and mix colors to paint their drab, gray barnyard. All the kids loved it. I think they're especially enamored because they got to paint after it, but Sweet Pea liked pointing out all the birds in it since "bird" is one of the ASL signs we've taught her. Anyway, for our second painting session, I had Little Brother mix yellow and blue together like they did in the story to get green. Then I drew a line with a pencil through the middle and told him just to paint the part below the line. I was really impressed with how well he followed the directions and stayed below the line...until he filled it in and kept wanting to paint and he starting going up the side. Next time I know to take the paper away and give him another one if he's finished the task and still wants to paint. For Sweet Pea, we did the paint drop routine again...I dropped little globs of green and white paint and she spread it around. I just dropped them on the bottom half, so that's where most of the green paint stayed. Then we let the paint dry for several days. 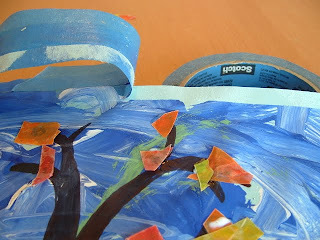 I had planned to have the kids use straws to add the fall leaves to the trees, like in the examples from the original. However, after making the fall leaves for our windows, I thought we'd use the scraps instead since they were so leaf-like and pretty. Little Brother LOVES to cut paper up. You give him paper and scissors and it will keep him entertained for half an hour. He'll even do it into the trash if you ask him to. He just loves to cut paper up. 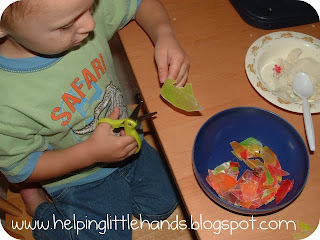 So the next time he asked to cut paper, I gave him the scraps and asked him to cut them into a bowl. Then I added the tree trunks for both kids using a permanent Sharpie marker. If I'd thought of doing it with paint ahead of time, I might have done that, but we were ready for the next step of the project and the Sharpie didn't need any drying time and worked great. 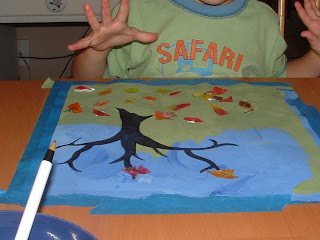 After reading LEAVES, LEAVES, LEAVES by Nancy Elizabeth Wallace for our preschool time, we got their paintings out again. (Awesome book, by the way, although better suited to kindergarten and older I think...can't wait to check out some of her other books.) 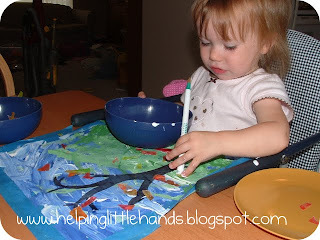 This time I gave each child a bowl with a little Mod Podge in it and a ball point pen. (You could use regular glue too.) 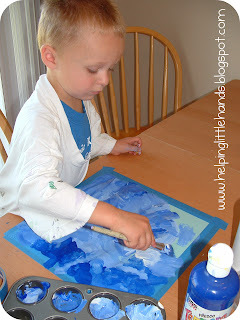 I had them use the back of the pen to dip in the Mod Podge and then put a dot on their paper. Then they put some of the paper scraps on their dot. 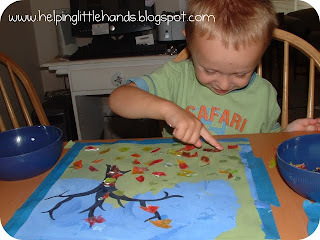 Little Brother especially loved adding the dots of Mod Podge, so at several points I took the Mod Podge away until he'd added leaves to his existing dots. 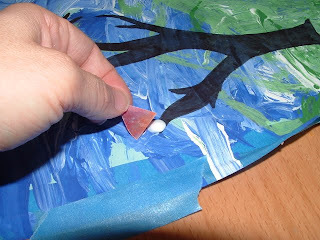 For Sweet Pea, we started with me doing the glue and her putting the leaves on. Then she wanted to do the glue so we switched roles. We did it as long as it was holding the kids' interest. Then we took the painters tape off. You want to be careful because it did take off a bit of the paper, and you don't want it to tear. I think it really gave the final painting a more polished "real art" sort of look. Firecracker made her own painting during last weekend and then finished up the gluing this weekend. 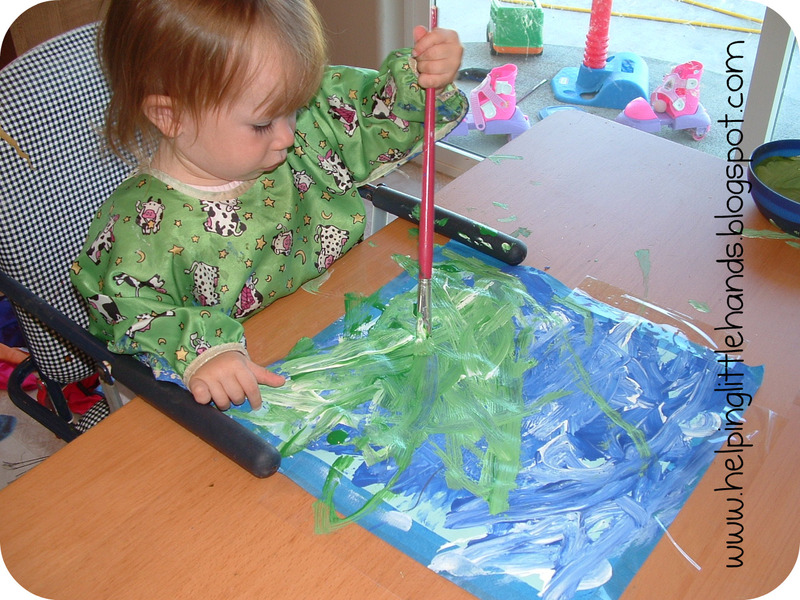 She was able to paint the whole background landscape in one session. 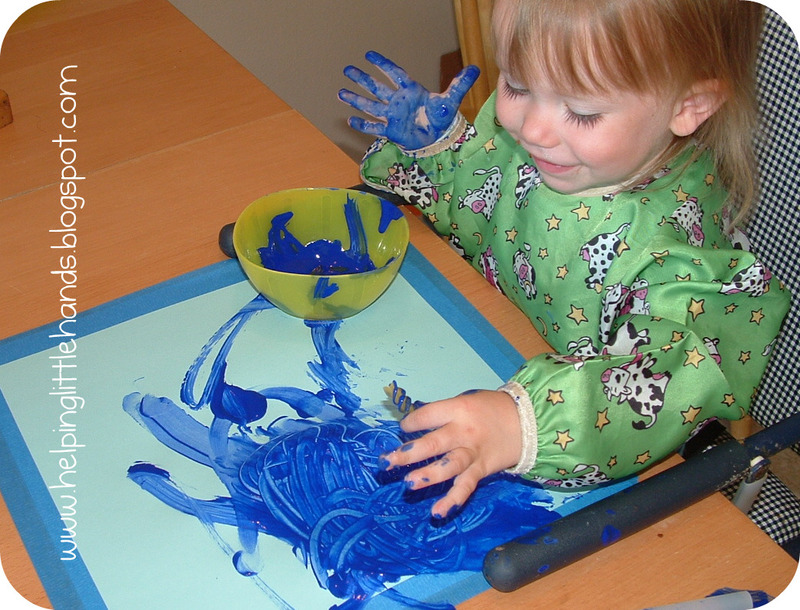 We had fun mixing the paint together. For the sky we started with blue mixed with some red because she thought that would make pink. 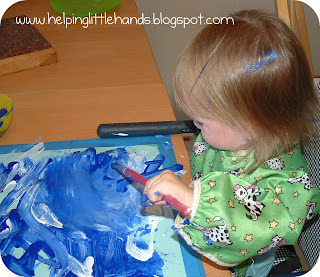 Then we took some of that mixture and kept adding more red and white until we had 4 shades based off the starting one that she used to paint the sky. I tried to get her to draw her own tree, but she insisted that I help her, so I outlined it and then she filled it in with the marker. I am SO happy with the results. They're on our new art display board for now, but if/when I get a fall display put together for the mantle, I think they'll go there. The kids are happy with them. Even Sweet Pea gets excited and points when she walks past it. And I'm happy with myself for managing to help the kids with an art project that they enjoyed so much and ended up looking like something. Sweet Pea's is on the left, Firecracker's is in the middle, and Little Brother's is on the right. 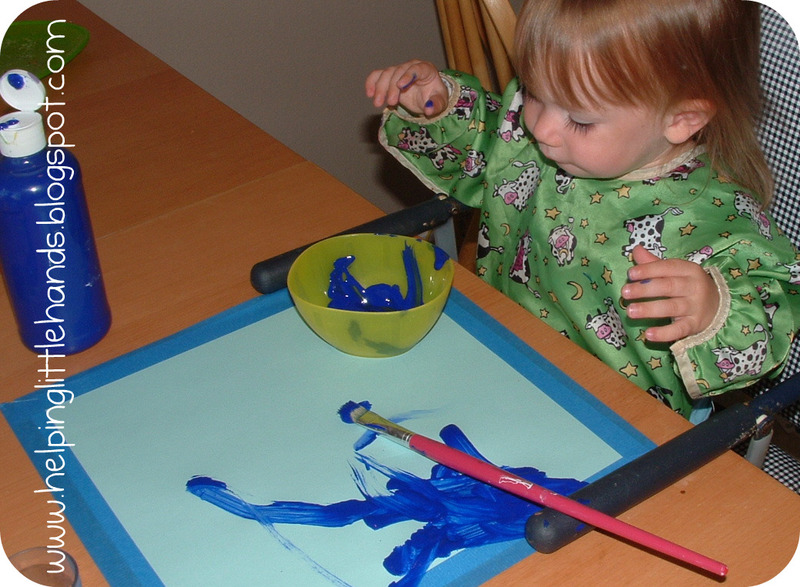 Your kids are really good artists! What a fun activity to do together! Thanks for sharing! These are wonderful. I'm impressed with the whole project, especially because you made it work with kids at three different levels of development. The blue-tape idea is genius. So is spreading out the project over 3 different sittings. Not only do the projects come out more finished that way, but you get 3 art days with the kids from only 1 project. A nice economy. Great fall decorations! So very lovely - thanks for the great idea. When it is Autumn over here, I will be giving this a go! This looks really good! I'm definetely going to make these with my kids too. I also featured you on my blog. Those truly are works of art- beautiful! I found you through ABC123- thanks for sharing! Found your blog over at the StArt linky. I think this project is beautiful Just wish I could draw trees that well. My daughter can color so beautifully inside the lines and then she will color it outside the lines. At least I know it was just scribbled on. Those turned out really pretty! 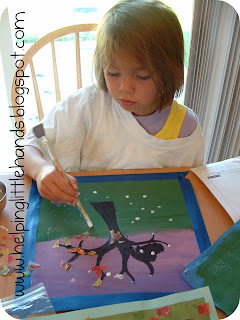 I am going to try this one at home with my 2 as well, looks like a great project for children of any age!